Fate sent me a helping hand in the form of a request from the landlady of Dinneywick's pub in Kingswood, the next-but-one village from where I live in the Cotswolds. 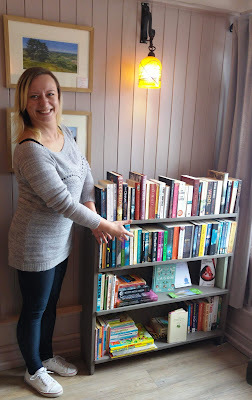 She asked me whether I could donate any secondhand books for the pub's new free library scheme. 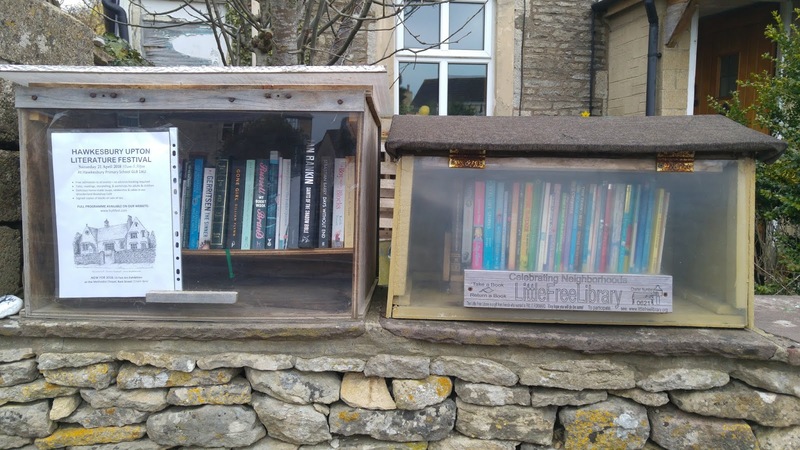 I've had a Little Free Library on my front garden wall for a couple of years, and there are more like this popping up all over the country. Aggie's interest in doing something similar came as no surprise. When she and her partner Guiseppe ran The Fox in Hawkesbury Upton, they gained a reputation as an innovative, energetic couple full of ideas for keeping a country pub afloat. 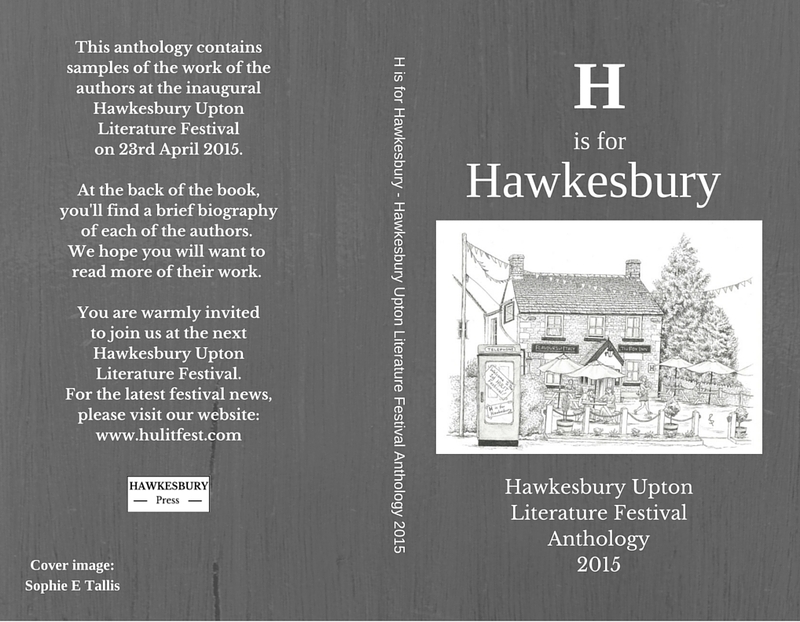 One of these ideas was to support the first ever Hawkesbury Upton Literature Festival when I founded it four years ago. They generously provided the venue, and for the next two Festivals were a key player in its success. As a tribute to their support, the cover of the first Festival's anthology sported a drawing of The Fox by Festival author and illustrator Sophie E Tallis. 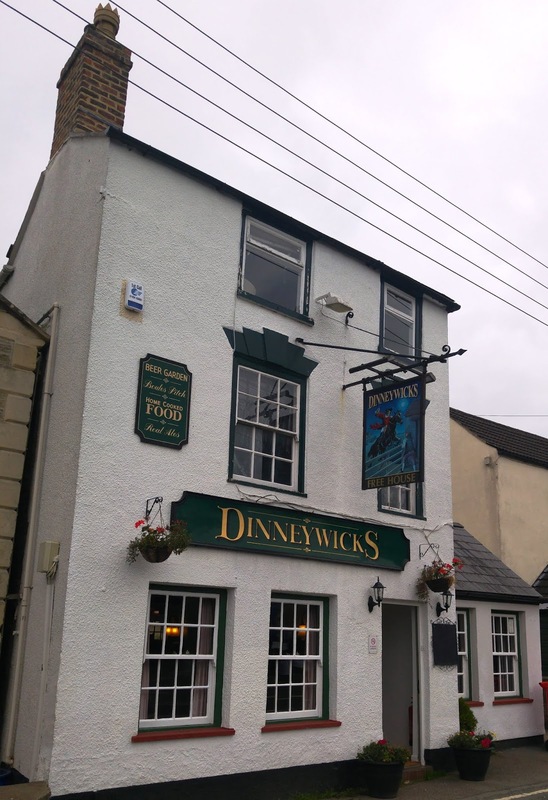 Earlier this year they moved to the delightfully quaint Dinneywicks pub in Kingswood, near Wotton-under-Edge. Dinneywicks customers will be able to borrow books for free from the Dinney's Little Library whenever they drop into the pub. "I'll have a pint of paperbacks, please." This is a valuable social service to a small rural community without its own public library. Customers are welcome to access it at any time during opening hours. Aggie is hoping that it will encourage people to come in for a coffee and chat during the day, as well as during the busier evening hours. All of the books are donated, and I was glad to be able to deliver two large bags yesterday to help fill their shelves. Most of the books are in as-new condition. 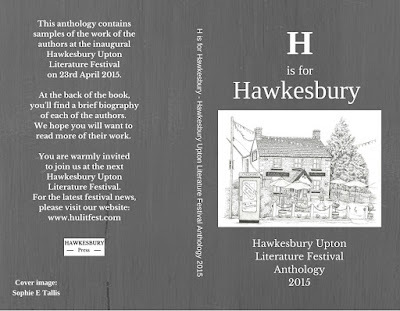 I was delighted to have the opportunity to return the favour that Aggie and Guiseppe did me when they were so supportive of the Hawkesbury Upton Lit Fest. 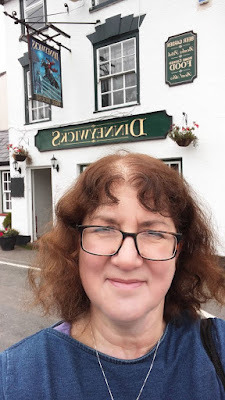 I know that Dinneys will be actively luring eager readers to the pub to enjoy their new facility, so this is a useful opportunity for me to reach a new audience. 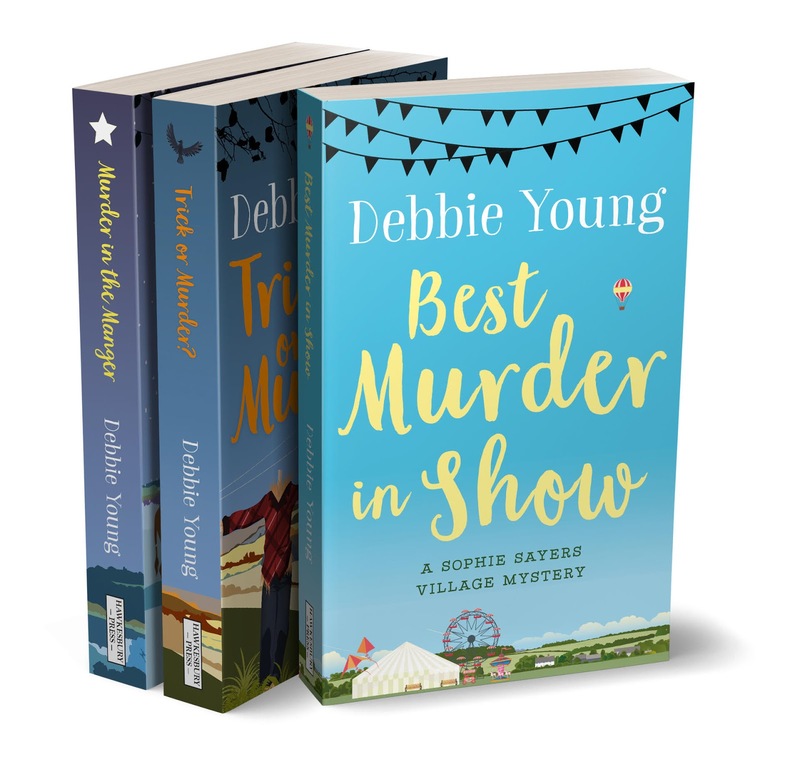 When you're writing a series of novels, free sampling is a handy marketing technique, assuming that if a person receives a free book in the series and enjoys it, it's quite likely they'll go on to buy the rest of them. It's a similar situation to finding a book in a charity shop or jumble sale. 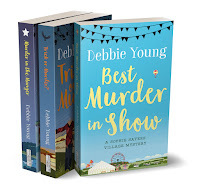 When a reader picks up a book for £1 or even pence there, the author may not profit from that sale, but he does gain valuable exposure and a connection with a potential new fan. That fan may go on to snap up full-price copies from conventional bookshops after that. I confess I only made this connection a few years back when I was interviewing Hereward Corbett, the proprietor of The Yellow-Lighted Bookshops in Nailsworth and Tetbury. I asked him whether he minded so many charity shops selling books in those towns, assuming he'd view them as competition undercutting his prices. Not at all, he told me, because readers would often take a punt on an unknown author, and once hooked came to his shops to order brand new copies of their other books at full price. I wish Aggie and Guiseppe every success with their new venture, and I hope their example will encourage other pubs to follow suit. Of course, Dinneywick's isn't just about books: it's a delightful pub, which they've just refurbished to a very high standard, with a cosy, attractive interior, pleasant walled garden and terrific food. So if you're passing that way, do call in to see them - with or without a book to donate! I am of an age when it is remarkably easy to get stuck in a mental rut: new story ideas have the unmistakable flavour of other books. You find yourself reaching for a familiar phrase, a particular sentence rhythm, hell, even a character name you have used before. If this has never happened to you, then move along, look away, you are probably youthful, mentally flexible and I have nothing interesting to say to you (though I am open to any tip you can offer me.) 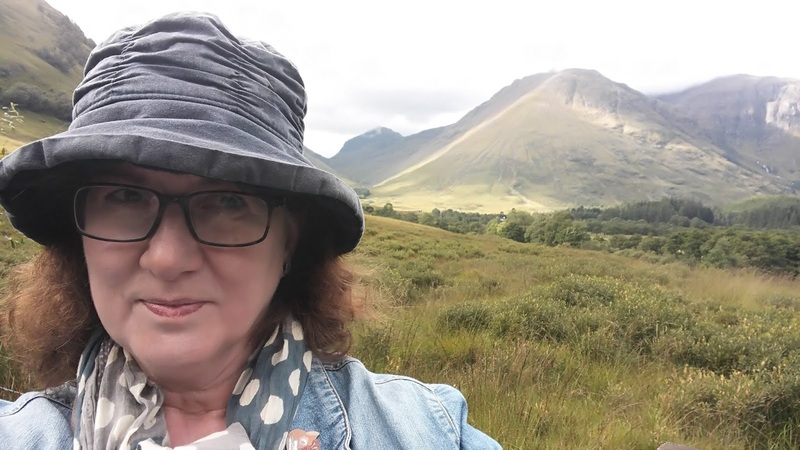 To everyone else, this has been my attempted solution: over the last few months, I have been experimenting with different forms of writing to force my lazy brain into forging new neural pathways, stave off early mental decline and re-energise my work. At least that has been the plan. I have been sticking to it too. I have written a few more short stories since my last post on the subject. One of them may form the basis of a novel. Or not. I am still writing the odd poem (they are very odd) since my last blog and I think the time I’ve spent word wrangling may yet do my prose some good. I have also tried storytelling just to push myself even further out of my comfort zone. As the event neared, I found myself increasingly concerned. What if people turned up expecting one of those all-round genius performers who could play a period instrument, recite poetry, sing dance and do (suitably historical) magical tricks? 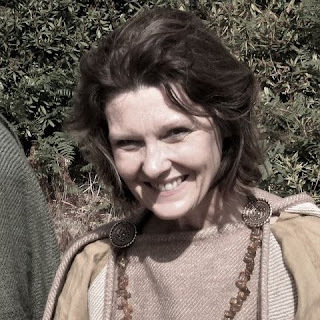 What if they were expecting an Anglo Saxon expert and all they got was me? Full of trepidation and that sinking feeling you have when you fear you have been an idiot, I learned the bones of some stories - more or less with a little bit of vagueness around the names - and decided to focus on what I could do rather than what I couldn’t. I used a few story-tellerish tricks and jumped around in dramatic fashion, but actually what worked best was just telling the story with conviction. When I trusted the story and stopped jumping around, you could hear a pin drop. So what has been the result of all this adventuring? I don’t think I’ve made any new pathways, I am still meandering down the same overgrown ill-kempt, byways of the mind as usual. But though my mental housekeeping and road building has been a failure, I think the short stories have helped my story structures, the poetry has helped me be more adventurous with words and the storytelling has reminded me of the thing I must be going senile to have forgotten: always trust the story. Well, the secret I've had to hold back on for two years is now out, as, if you follow me on Facebook, you'll already know. 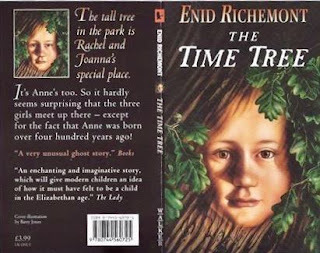 The modest film deal I've referred to from time to time was based on my first children's novel, THE TIME TREE, published by Walker Books in the early Nineties, and a first for them, too, as it was the first time they'd published a children's novel. The book stayed in print for ages, and seemed to grab people in a very special way. It's a time-slip story - a magical encounter, via an ancient oak tree, between two contemporary eleven year old girls, and a profoundly deaf Elizabethan girl of the same age. 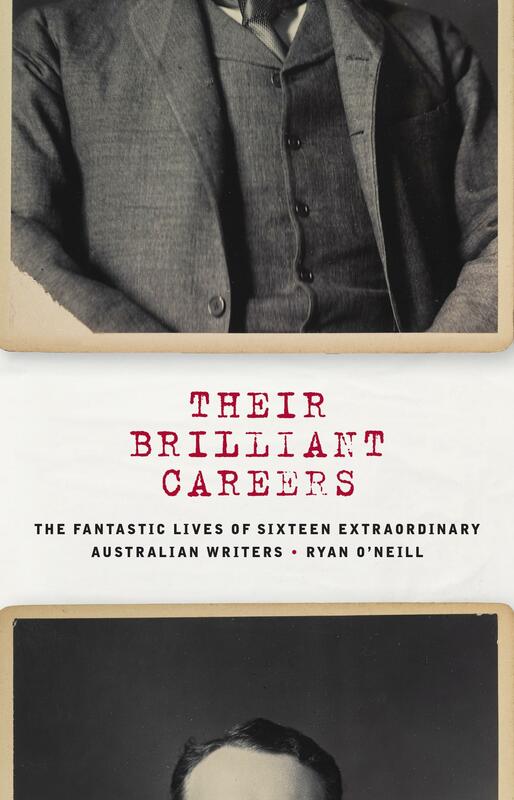 It's a book that grabbed a very close friend who works in the media, and who had always seen it as a film (I didn't) so she pushed me into writing a screenplay with a number of plot extensions and developments, which was challenging and exciting. Writing for the screen is SO very different from writing a novel, because the whole story has to be conveyed via dialogue and visuals - in a screenplay, you can't, with words, get inside the heads of your characters - they have to express their feelings through either dialogue or acting. I love doing it, although, frankly, I didn't think it was going anywhere. Then suddenly, two years ago, it did. Competition is fierce in the film business, so I was sworn to absolute secrecy. Even a hint, without even naming the book, was jumped on. I have, obliquely, mentioned it on here from time to time, just talking about the challenge of writing for film, but no more. The project started out as a feature length film, but ended (disappointingly for me) as a short film, which nevertheless got it screened recently at the Sarajevo Film Festival, which we're hoping will get it noticed. This is one of the stills. 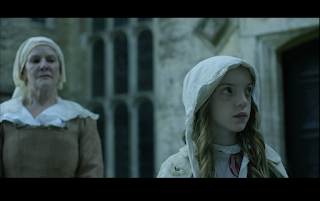 The fierce and unpleasant woman on the left (she's in charge of the equally unpleasant household staff) is played to the hilt by Frances Tomelty, and the child on the right is the Elizabethan girl, Anne. 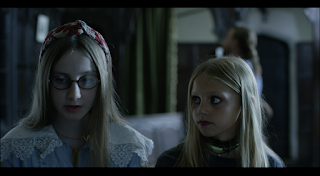 The young actress who played her had to take lessons in how to be profoundly deaf - not easy, but she did it very convincingly. Below (and a very dark shot - sorry) are the two contemporary girls. It was not only hard, but also dangerous, to be at all 'different' in the sixteenth century, with its total belief in witchcraft. Discussing this with a female writer friend yesterday, we both decided that she'd almost certainly have been classified as a witch - red-haired, female, owns not only one but two cats, and with marks on her skin - freckles and the odd small mole - ticks all the boxes, so ripe for the pricking. If you're curious, the book isn't available as an ebook (there was too much hanging on it to do that), and is very hard to get hold of second-hand, but you can try. Abe Books is very good. However, the text does seriously need updating, much of which I've already done via the screenplays. Hoping now for a full-length screen offer, followed by a book deal, but maybe that's the wrong way round? NOTE: This article was first published on the Poetry Foundation website on May 21, 2014. 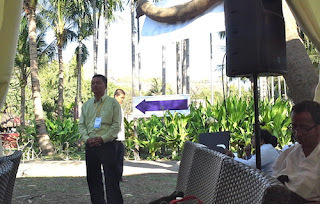 The Irrawaddy Literary Festival remains one of the most interesting festivals I've participated in, and I feel privileged to have been a part of this historic festival, even though the patron, Aung San Suu Kyi, has not lived up to the ideals she represented in 2014. The Champak, fragrant with white blossoms growing wild on Mandalay hill, perfumes the gardens of the Mandalay Hill Resort. 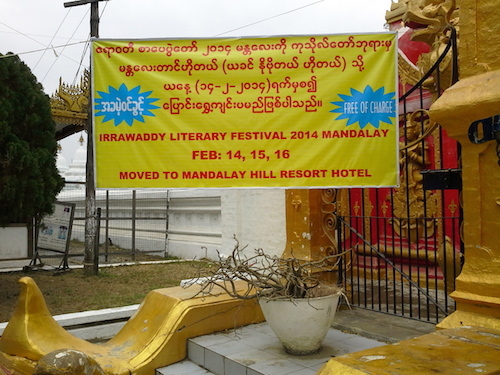 This is where the 2014 Irrawaddy Literary Festival was held from February 14-16, with poetry read under white canopies amid the feathery foliage. Palm trees fringed tiny wooden pagodas; even the breeze was mellow. In this most Zen-like of settings, the Myanmar poets read fiery words. 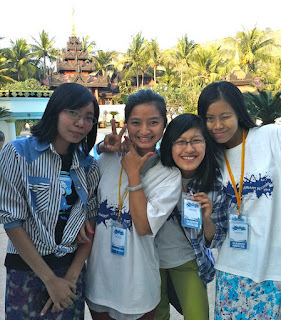 Words to inspire the schoolchildren bussed into the venue from Myit Nge and surrounding schools, children with faces plastered with the yellowish-white thanaka paste, distinguishing them from the trendy young volunteers from the Jefferson Centre who spoke fluent English. There were very young nuns in light pink robes, and older male monks in robes of red and deep orange. “We are a credit to Burma”. Her English words, reminiscent of the Kiplingesque verses read on plantation verandahs peopled by colonial masters, were like nothing that followed. 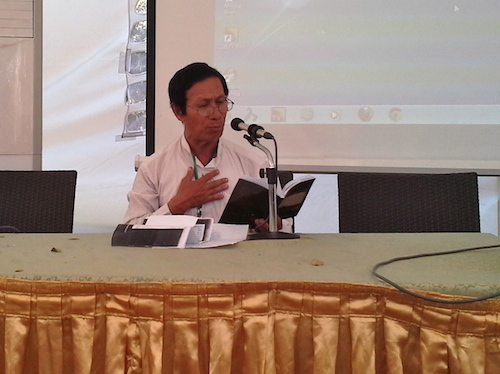 As Pyae Phyo Ti began his poem, the young interpreter hidden behind the electrical equipment caught my eye. A device in my ear would sound the simultaneous translation into English, but the volunteers were very new to this. In an earlier session, the translator had collapsed into a fit of uncontrollable laughter at a speaker’s comment, which had clearly been irreproducible into English. The poem "Scars from the Story of Scholars" is introduced as the story of Mandalay, but is a diatribe against the economic colonization of Myanmar by the Chinese. Much fist-shaking fury accompanies the words about people buying land and taking over local business, and the translation provided include “Brutally murdered” and “Demonstrations.” The poet ends with the thought that although rumor has it that Mandalay will become just another province of Yunnan, it is still not too late for action. At the Q&A session that follows, a young monk strides up to the microphone, his intent clear in the hard set of his face: “The poem shows that you are a great nationalist. What if people are saying you are an extreme nationalist?" The tent thrums with anticipation as the poet and the monk face off for a few seconds. The poet pauses to catch his breath as the questions come from all sides, mostly belligerent. No questions are asked in English, and this becomes a contentious argument for national identity versus economic progress. Besides, only a handful of foreigners are in the audience. A mother loves her children more than herself. So for the sake of a mother’s love, may all men cease war. We all have to walk the path of peace. Universities should teach peace. We have a Ministry of Defense, but no Ministry of Peace. No country has a Ministry of Peace! Let us work together to set up Ministries of Peace in each and every country. Let us remove mines and bombs and have less fighting and war! I do not talk of romantic love. The love I speak of is very maternal, pure and clean, peaceful. We are not reciting a poem but celebrating a convocation. A degree is given to scholars who have learnt the subject. Now a convocation for the doctorate degree of a mother’s love for the nation! He strikes a chord in the audience; the questions are less hostile. There is a sense of calm as the last two poets, Nyan Myo Htei and Thin Thin Aye Hein, take the stage. 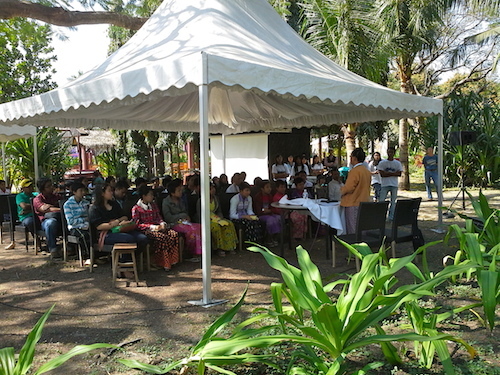 Later, I would discover that the sessions with the Burmese writers have been very combative, especially as controversy has dogged the second year of this festival. Official permission to use the Kuthodaw Pagoda as the venue—a historical site slated as the “world’s largest book”—was withdrawn on the eve of the festival and a writers’ boycott also suggested some powerful political maneuvering. The festival organizers had to scramble to find another venue, but the organizing committee, headed by resourceful Jane Heyn, ensured that the festival would go on. The patron of the Irrawaddy Literary Festival is Daw Aung San Suu Kyi, now an elected Member of Parliament and a powerful member of the opposition possibly on the road to securing the presidency. 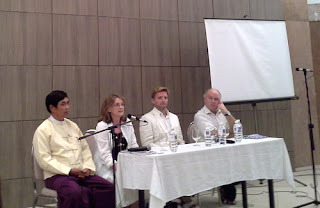 Her presence was enough to speak volumes about the free exchange of literary thoughts and ideas that this festival sought to engender and Aung San Suu Kyi steered clear of any political rhetoric during her brief appearance, preferring to chat, fairly casually, about the literary influences on her own life. But the impact of a festival like this was indisputable inside the many tents. Author Saya Kaung Thant spoke about Buddhist charity (“To donate, share –smile at least— it is a kind of donation. Feed a dog or a cat with the water in your house”) as well as democracy (“Refuse the fear and stand for the public with bright courage...only then will the journey to democracy begin”). His audience, mostly teenagers, listened with rapt attention. Dr Aung Myint, a member of the organizing committee and an author, delivered an emotional closing speech: To be in a room like this, filled with the people of Myanmar chatting easily to foreign writers who had come from around the world, felt simply unbelievable.